Chronic subdural hematoma (CSDH) is the most frequent type of intracranial disorder which carries a most favorable prognosis when diagnosed early, accurately, and treated adequately. A significant increase in the incidence of CSDH has been observed in developing countries due to the rise in life expectancy.,,, There is a lack of uniformity about the treatment strategies among various institutions, for example, local and general anesthesia, the role of burr hole, twist drill, and craniotomy, in CSDH among various surgeons. There is also disagreement about the use of drain, irrigation, anticonvulsants, and steroid., There is always a controversy in anticonvulsants among neurosurgeons and neurologists. The annual incidence of CSDH is about 1–5.3 cases per 100,000 population. The incidence is increasing due to the increase in aging population, associated medical diseases (diabetes mellitus and hypertension [HTN]) such as anticoagulant (AC), and/or antiplatelet therapy., Although the surgical techniques are simple, recurrences remain one of the challenges in the treatment. In our department, burr-hole evacuation with closed system drainage has been the operative technique of the first choice for 3 consecutive years. The aim of this study is to present our experience of the surgical management of 78 patients with CSDH and to emphasize the importance of the factors that contribute to neurological outcome, by not using closed suction drains and the relevance of the ACs in terms of recurrence, age, and the preoperative status. This clinical study includes 78 adult patients with CSDH, who were treated surgically at the Neurosurgical Department of Medical College, from October 2016 to September 2017 for 1 year. This series represents the experience of our neurosurgical unit which is in the infancy of development for the last 4 years. It is a territory center, covering a wide area of Jammu province with various cultural diversities, in managing 78 CSDH cases with burr hole, and a closed drainage system of a total of 39 CSDH patients and without drain in 39 patients randomly selected. Patients were included in this study if the clinical presentation was because of CSDH alone. We excluded all patients who had been previously operated elsewhere or with incomplete medical records. Information was obtained retrospectively by reviewing the clinical histories. The sample population was composed of 61 males and 17 females (ratio: 3.6:1), with a mean age of 64.5 years (range: 23–98 years). Fifty-one (65.4%) had a history of head trauma and most of which were minor or moderate. Twenty (25.6%) patients could not remember any history of injury, whereas 7 (8.9%) patients had acute trauma and had waited for about 20–30 days on average before surgery. The neurological status on admission was assessed as per the Glasgow Coma Scale (GCS) associated with hemiparesis. Forty-three patients had GCS of 15/15 with 21 patients having hemiparesis varying from 2/5 to 5/5; out of 27 bilateral CSDH cases, 22 had GCS of 15/15. Twenty-seven patients had GCS of 14/15, three had 13/15, two had 8/15, and 3 had 7/15 GCS. Four of the patients needed to be electively ventilated and two had a drastic improvement in which the first one was extubated on the 1st postoperative day and the second one was extubated on the 3rd postoperative day. Two patients were kept on prolonged ventilation in which the first one was reoperated after 15 days and kept for 22 days in the intensive care unit developed empyema and had recurrent seizures and the second one was kept intubated for 14 days and was extubated but remained with low GCS and persistent seizures. The leading symptom was weakness with abnormal behaviors 50% (39 patients) and headache 41% (32 patients), and 7 (8.9%) patients were admitted with a history of acute trauma initially with small acute SDH whom were managed conservatively. Predisposing factors included the administration of AC or antiaggregant therapy (19 patients), alcohol abuse (4 patients), arterial HTN (14 patients), cerebral vascular accident (CVA) (3 patients), and diabetes mellitus (11 patients). Other concomitant pathological conditions were chronic obstructive pulmonary disease, seizures, superficial wound infection, acute intracranial hematoma, valvular heart disease, alcoholic liver disease, and coronary artery bypass grafting. In all cases, diagnosis was based on computed tomography (CT), and radiological measures of the CSDH, including the width of hematoma, membrane, loculations, and midline shift, were determined based on CT scans obtained before the operational procedure. The CSDH was right sided in 63 patients (47%), left sided in 15 patients (19%), and bilateral in the remaining 26 (33%). Routine laboratory studies before surgery included a complete blood count, platelet count, international normalized ratio, prothrombin time, and biochemical investigations. Any antiaggregant and AC therapy was temporarily discontinued upon admission and re-established no earlier than 2 weeks after the operation. Coagulopathy, if present, was corrected preoperatively by Vitamin K, intravenous (IV) infusion of fresh-frozen plasma, or platelets (rarely). Surgery was performed with local anesthesia and mild neuroleptanalgesia with anesthetist in the operating room, and perioperative antibiotic prophylaxis was given in all cases. Moreover, all patients received anticonvulsants postoperatively for minimum of 2 weeks, and those having seizures are continued in the usual way. The operative technique had been standard burr-hole drainage with frontal and parietal burr hole which was decided preoperatively comparing to the site of the hematoma. No patient was converted to craniotomy in our series. We never tried to remove the SDH vigorously. A feeding tube no. 5 or ventricular drain was introduced under direct vision into the subdural space, and particular precaution was taken not to injure the inner membrane of the hematoma or the brain. Irrigation was done with warm normal saline until the fluid was clear, and average time for one side was 6.5–9 min. In cases where closed drainage was placed, the drainage was maintained for a period ranging from 2 to a maximum of 5 days postoperatively depending on the amount of draining liquid obtained. All bilateral CSDHs were operated upon at the same session. Postoperatively, the patients were adequately hydrated given 2.5 L of IV fluids a day for 1–2 days to promote expansion of the brain along with 5 days of antibiotics, painkillers, H2 blockers, and anticonvulsants. Postoperative CT scan of all patients was only done in case the patient did not showed adequate improvement or is deteriorated. In cases where postoperative CT was done for evaluation, we focused on the maximum residual hematoma thickness, the midline displacement, and the amount of residual air into the subdural cavity. The patients were assessed periodically, and CT scans were normally repeated at subsequent outpatient department visits 4 weeks after discharge if there was any residual collection shown in the first postoperative scan or earlier if the symptoms reoccurred. All patients included in this series were followed up for at least 1 month postoperatively. The outcome was assessed at 1 month according to the Glasgow Outcome Scale. Postoperative complications occurred in seven patients (8.9%). The most common complication was a recurrence of CSDH. In a total of five patients (6.4%), further surgery was required to remove a symptomatic recurrence of CSDH. The first recurrence was again treated by reopening the burr hole, but in one patient, mini craniotomy was performed because of the development of empyema. Early major postoperative air accumulation into the subdural cavity was detected only in two patients. One of these suffered tension pneumocephalus with severe headache which was managed conservatively. In two patients, surgery was complicated by the development of small intraparenchymatous bleeds in the cerebral hemispheres and basal ganglia (could be secondary due to HTN). All resolved gradually with no need for additional surgery. None of the patients developed an acute subdural requiring craniotomy. Six patients developed a superficial wound infection and underwent local debridement in addition to IV antibiotic therapy. Culture sensitivity done revealed Staphylococcus aureus. 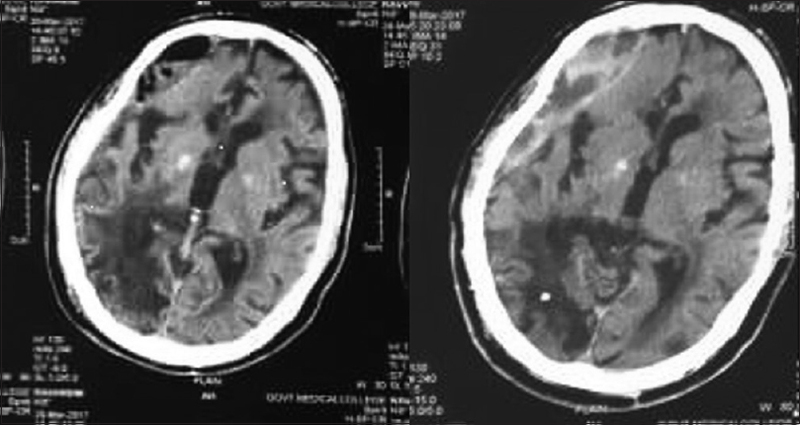 One patient developed subdural empyema which required a craniotomy [Figure 1]. In our series, all patients were given anticonvulsants and none of the patient developed postoperative new onset seizures. Out of 78 patient's, 77 patient's had full recovery, one patient who developed postoperative basal ganglia bleed had residual weakness and was ambulatory with support. The female patient whom developed intracerebral bleed recovered fully without any deficit. In our study, we used closed drain in 39 (50%) patients and no drain in the rest (39, 50%) patients randomly. The Recurrence was in 7 patient [6.7%] All patients had recurrence in the frontal region. Out of 19 patients on ACs, only three patients developed recurrence. Three (2.8%) patients with drain and four (3.8%) patients without drain developed recurrence (statistically insignificance) (P < 0.005). The results of this study reinforce many previous findings on the prediction of outcome for patients with CSDH. Previous studies have clearly reported the bad outcome in patients with lower neurological status on admission. As always in neurosurgery, poor neurological condition on admission has a negative effect on the outcome. After the introduction of CT scanning, diagnosis and outcome of CSDH became much improved. Evidence of brain atrophy received particular attention since several studies have shown that the presence of brain atrophy in CSDH is associated with a worse outcome.,, Santarius et al. Similarly reported lower recurrence rates with use of drains. Recently, with increasing numbers of elderly people in the general population, the number of patients who are treated with ACs and antiplatelets is also increasing. These agents are commonly used as prophylactics against cerebral ischemic stroke, myocardial infarction, valvular heart disease, or deep venous thrombosis. Anticoagulants and antiplatelets were the major cause of CSDH in elderly patients, risk of recurrence is reduced if anticoagulants and antiplatelets are stopped 5-7 days before the procedure. Moreover, although the neurological grade on admission emerges as the most powerful early predictor of outcome, radiological variables, such as thickness and density of subdural collection and postoperative accumulation of air into the subdural cavity, might help identify different groups of patients even within the same levels of neurological severity. Santarius et al., Carlsen et al. Ramachandran and Hegde, Wakai et al., Tsutsumi et al., Gurelik et al., and Sarnvivad et al. reported 9.3%,14% 4%, 5%, 3.1%, 10.5%, and 16% recurrence rates, respectively, in the drainage group, as compared to 24%,26%, 30%, 33%, 17%, 19%, and 26%, respectively, in without drain group. Continuous drainage therapy for CSDH is superior to the one-time drainage method, with shorter postoperative hospitalization and low recurrence,, whereas in our series, 3 (2.8%) patients with drain and 4 (3.8%) patients without drain developed recurrence (statistically insignificance) (P < 0.005). The overall recurrence rates in both the groups were found to be low. Most of the elderly patients present to the neurosurgery department with hemiparesis and urinary problems with the diagnosis of chronic SDH. Burr-hole evacuation is a relatively safe and effective first-line management option. All cases done under local anaesthesis. The patients had excellent recovery postoperatively. As per our study, the recurrence rate is not associated with the use of a drain after burr-hole evacuation of a CSDH. The golden rule is proper irrigation and effectively closure, which reduces the complications. Gorelick PB, Weisman SM. Risk of hemorrhagic stroke with aspirin use: An update. Stroke 2005;36:1801-7. Spallone A, Giuffrè R, Gagliardi FM, Vagnozzi R. Chronic subdural hematoma in extremely aged patients. Eur Neurol 1989;29:18-22. Zingale A, Albanese V, Romano A, Distefano G, Chiaramonte J. Traumatic chronic subdural hematoma over 80 years. A preliminary prospective study. J Neurosurg Sci 1997;41:169-73. Karibe H, Kameyama M, Kawase M, Hirano T, Kawaguchi T, Tominaga T, et al. Epidemiology of chronic subdural hematomas. No Shinkei Geka 2011;39:1149-53. Jennett B, Bond M. Assessment of outcome after severe brain damage. A practical scale. Lancet 1975;1:480-4. Nakaguchi H, Tanishima T, Yoshimasu N. Relationship between drainage catheter location and postoperative recurrence of chronic subdural hematoma after burr-hole irrigation and closed-system drainage. J Neurosurg 2000;93:791-5. Okada Y, Akai T, Okamoto K, Iida T, Takata H, Iizuka H, et al. A comparative study of the treatment of chronic subdural hematoma-burr hole drainage versus burr hole irrigation. Surg Neurol 2002;57:405-9. Ramachandran R, Hegde T. Chronic subdural hematomas-causes of morbidity and mortality. Surg Neurol 2007;67:367-72. Fukui S. Evaluation of surgical treatment for chronic subdural hematoma in extremely aged (over 80 years old) patients. No To Shinkei 1993;45:449-53. Ooba S, Shiomi N, Shigemori M. Clinical features and surgical results of chronic subdural hematoma in the extremely aged patients. No Shinkei Geka 2006;34:273-8.
van Havenbergh T, van Calenbergh F, Goffin J, Plets C. Outcome of chronic subdural haematoma: Analysis of prognostic factors. Br J Neurosurg 1996;10:35-9. Santarius T, Qureshi HU, Sivakumaran R, Kirkpatrick PJ, Kirollos RW, Hutchinson PJ, et al. The role of external drains and peritoneal conduits in the treatment of recurrent chronic subdural hematoma. World Neurosurg 2010;73:747-50. Wakai S, Hashimoto K, Watanabe N, Inoh S, Ochiai C, Nagai M, et al. Efficacy of closed-system drainage in treating chronic subdural hematoma: A prospective comparative study. Neurosurgery 1990;26:771-3. Tsutsumi K, Maeda K, Iijima A, Usui M, Okada Y, Kirino T, et al. The relationship of preoperative magnetic resonance imaging findings and closed system drainage in the recurrence of chronic subdural hematoma. J Neurosurg 1997;87:870-5. Gurelik M, Aslan A, Gurelik B, Ozum U, Karadag O, Kars HZ, et al. A safe and effective method for treatment of chronic subdural haematoma. Can J Neurol Sci 2007;34:84-7.